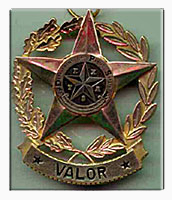 The Commissioner's Medal of Valor is the highest honor bestowed by the Texas Department of Public Safety. It is awarded to officers who have displayed conspicuous gallantry, courage and heroism at considerable risk to their own lives. The Medal of Valor has been awarded to four Texas Rangers - Sgt. William R. Gerth, Sgt. Stanley Keith Guffey, Sgt. John Aycock, Sgt. Danny V. Rhea. "Awarded in recognition of the gallant manner in which he risked his own life to preserve that of a fellow law enforcement officer. Ranger William R. Gerth, on May 19, 1983, in Wichita Falls, Texas, responded to a police department radio broadcast advising that an alleged bank robber was travelling on Sisk Road in that City. Ranger Gerth observed the suspect vehicle and requested backup support from a DPS trooper. As the trooper joined pursuit, the suspect vehicle came to an abrupt stop. The robbery suspect exited his vehicle and immediately opened fire with an automatic weapon on the trooper causing minor lacerations and pinning the trooper inside his vehicle. As the armed suspect approached the trooper's vehicle, Ranger Gerth became involved in an exchange of gunfire with the suspect which resulted in the suspect being killed. As a result of Gerth's positive, timely, and gallant actions, the life of the DPS trooper was spared." Stanley Keith Guffey was born in November of 1946 at Perryton, Texas. He joined the Texas Department of Public Safety as a patrolman in 1968 and served with distinction until he transferred to the Texas Rangers in 1979. His duty stations included Company D in Laredo, Texas and Company F, in Waco. In January of 1987, Brent Albert Beeler, a parolee from Houston wanted for forgery, made his way to Horseshoe Bay, Texas. He kidnapped two-year-old Kara Lee Whitehead, daughter of local rancher Bill Whitehead and his wife Leigh, and their maid, 22-year-old Denise Johnson. Beeler barricaded himself in a house, killed Johnson, and demanded $30,000 and a car to release Kara Lee Whitehead. Determined not to let Beeler escape with the child, Texas Rangers Stanley Guffey and John Aycock volunteered to hide in the back of a Lincoln Town Car with the rear seat removed. When the car was delivered, Beeler placed the girl in the front seat and threw a briefcase with the money in the back. In so doing he spotted Guffey, who identified himself as a Texas Ranger, and ordered Beeler to surrender. In the seconds it took Guffey to identify himself, Beeler fired a .44 Magnum revolver, fatally wounding Ranger Guffey. Guffey was able to fire one shot before collapsing, but it missed Beeler. Ranger Aycock returned fire through the car window, fatally wounding Beeler. He quickly pulled Kara Lee Whitehead to the rear of the car out of harms way before leaving the vehicle to approach Beeler. Ranger Guffey was posthumously awarded the Department of Public Safety Commissioner's Medals of Valor for his actions and sacrifice in saving Kara Lee Whitehead. The 70th Texas State Legislature memorialized Stanley Guffey with a resolution and more than 1,200 mourners attended his funeral. "Awarded in recognition of the gallant and courageous manner in which he effected the rescue of a kidnapped child being held for ransom at the risk of his own life. 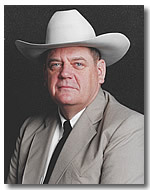 Texas Ranger Johnnie E. Aycock, along with Texas Ranger Stanley Keith Guffey, on January 22, 1987, in Llano County, Texas, volunteered to be the arrest and rescue team in a high-risk tactical operation. It had been determined that a kidnapper holding a two-year-old-girl for ransom could not be permitted to depart a designated ransom-exchange area with the kidnapped child, as it was believed he would attempt to murder her. He had claimed to have murdered a second victim, which claim was subsequently determined to be true. Ranger Aycock, along with his fellow Ranger, concealed himself in an automobile that was to be delivered to the kidnapper at the exchange point. The subject appeared and, rather than releasing the child, placedher and the ransom money in the vehicle where he was confronted by the Rangers, who identified themselves in an effort to effect his surrender and avoid bloodshed. The kidnapper commenced firing and, in an ensuing exchange of gunfire between the Rangers and the suspect, the suspect was killed and and Sgt. Guffey was mortally wounded. These heroic actions rescued the kidnapped victim from certain death. Ranger Aycock's dedication to duty, his concern for human life, and gallantry and courage exhibited while fulfilling the responsibilities of his chosen life role brought much credit to himself and to the cause of law enforcement." "Awarded in recognition of his valorous performance and extraordinary skill exhibited during the successful conclusion of a life-threatening hostage situation. Sergeant Aycock was involved as a "hostage negotiator" during a situation where an individual was holding a 14-month-old child at gunpoint and law enforcement officials in a standoff in a field in rural Mills County. The individual had kidnapped the child earlier in the day, firing a 12-gauge shotgun through a door of a residence threatening to kill the child's mother. A high-speed chase ensued and the individual's stolen vehicle was disabled. Continuously threatening the life of the child, the individual indicated that he might attempt suicide. Over approximately a four hour period, Sgt. Aycock at great personal risk, exhibited extraordinarycourage, skill, and judgment in negotiating with the individual and finally successfully rescued the child and arrested the individual. His performance exemplifies the high standards of the Ranger Division and reflects credit upon him, the Texas Department of Public Safety, and the law enforcement profession." "Awarded in recognition of his valorous and professional response exhibited during a crisis situation where he faced a deranged individual holding what was believed to be an explosive device in a Texas Department of Public Safety building. On January 6, 1998, Ranger Sergeant Danny V. Rhea assisted Trooper Cody Sanders and Trooper George K. Harris in dealing with a man who was carrying what was identified as a bomb at the Sulphur Springs Texas Department of Public Safety office. The man told Trooper Harris to evacuate the building because he was going to blow himself up. The building was evacuated and the officers negotiated with the man for almost an hour believing he was holding an explosive device and intended to detonate the device. The man eventually displayed a handgun and pointed it at Trooper Harris. Ranger Sergeant Rhea then fired one shot, fatally wounding the man. Ranger Sergeant Rhea's courage, decisive action, and dedication to duty in this tense and volatile situation bring great credit to him, the Texas Department of Public Safety, and the profession of law enforcement."